About 330 km from Hanoi Capital, Sapa is located on Hoang Lien Son Range. It is a picturesque village near the Chinese border in north-west Vietnam. Sapa is one of the most enchanting of the Vietnam popular destinations thanks to its beautiful unspoiled landscapes and diverse culture, Sapa has become a favorite tourist destination of many domestic and international tourists. One thing for sure that terraced fields stretching on mountain, hillsides, and in valleys in Sapa are the most famous sites drawing visitors and photographers, especially in the ripening rice season. Many say that, " they have visited many places elsewhere but terraced rice fields in Sapa are the most beautiful. It was unbelievable that the local people can grow rice on a terraced field which is dry in hot weather and rice can’t grow.” The autumn, Sapa looks like a golden silk band, especially in September, the harvest time. 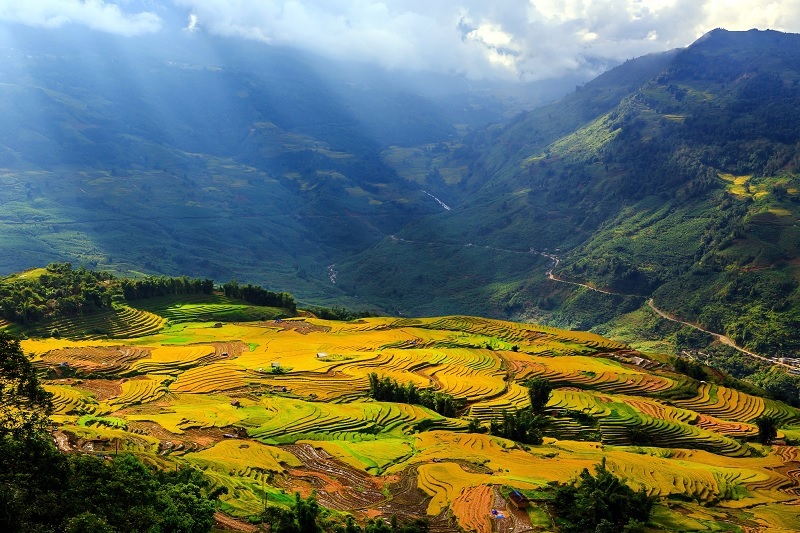 The season of ripe rice is always the most beautiful season in Sapa, viewed from above, stretches through the hills, layers of layers of rice fields ripe yellow, occasionally intermingled with a layer of green rice, The rice plan is ripe, all make a beautiful painting that any visitors who admire the prairie also praised. Get up to Sapa right away, to enjoy all this magnificent scenery, to stand still for a few seconds before the majestic nature, to be uttered "Oh great", "Nice too", "It is heaven"!